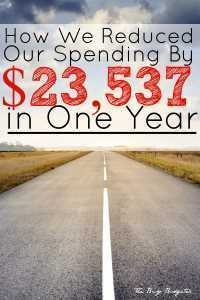 Since we've been married and I began tracking our spending, we've made a lot of changes. None were dramatic, but they led to some pretty dramatic figures. 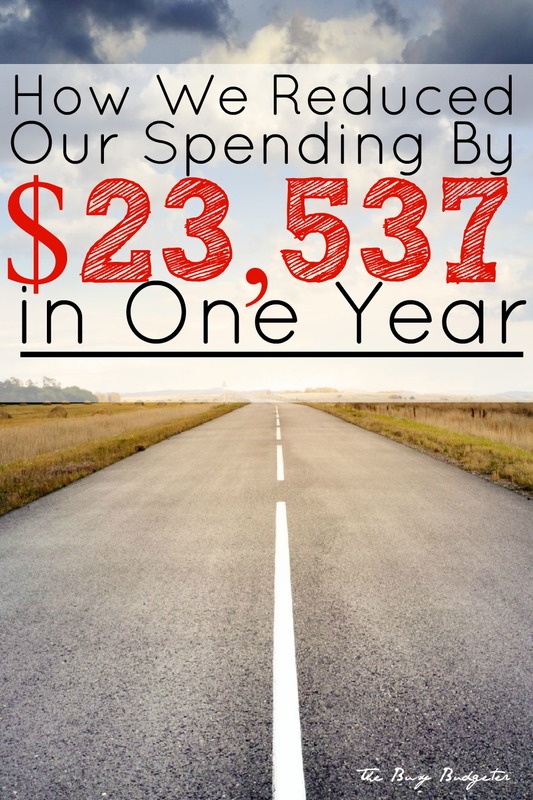 The following list was implemented over time and led to us saving $23,537.00 in the last year. 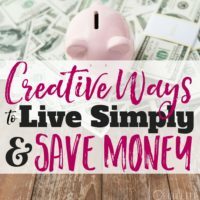 By my opinion, we were already living relatively frugally when I began making changes, so if you aren't already paying attention to how you spend your money, you could easily do even better with these money saving tips. I also think it's important to point out that I don't believe in sacrificing for money. We live just once, I won't use a product that I don't like or cut things that are important to me out of our budget. The goal in budgeting for me is to spend less to get the same thing, or something that works better. 1. Eliminated Eating Lunches out at work, for better packed lunches that save time, calories and taste better. 2. Began menu planning and strategic shopping using Wegmans online tools to reduce grocery spending. 3. Began using the library exclusively and stopped buying books at all. 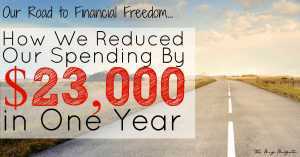 Savings: $3,600 (about 70.00 per week on average) – 0.00 = $3,600.00 saved. 4. Stopped drinking bottled water and switched to filtered water in reusable bottles exclusively. Savings: 42.97 per month (from water bottles and deer park delivery – cost of filters, and purchasing high quality water bottles and the occasional gallon water bottle to bring to work to refill) x12= $515.64 saved. 5. Established a home stock room, researched best unit price for all items. Also saved significant time running errands and shopping. Click here for more information on my home stock room and here for my free inventory workbook to keep track of it. Savings: $1,357.43 per year. (see next weeks post for specific break down of savings). 6. Cancel cable and use hulu plus for TV exclusively (Jon also hooked up our seldom used desktop computer to the TV so that you can watch the free full episodes on the network sites in the TV). You can read more about that here. 7. Cancelled the Gym membership and began using the community association gym and pool for free. Savings: $600.00 (50.00 per month) – 0.00 = $600.00 saved. 8. Began using moderate coupons on items I'm already buying. 11. Began the $10.00 Christmas Tradition with my extended family.Click here to learn more about that. Savings: $300 per year – $80 per year = $220.00 saved. 12. Purchased clothing needs at thrift stores and discount stores. (Not exclusively- still a few pieces purchased at retailer). Savings: $620.00 less spent this year on clothing than last year. 13. Stopped purchasing music on iTunes and began renting all of my CD's from the library (which can be turned into MP3's by hooking up to your computer.) Note: While likely unenforceable, please delete MP3 after CD is returned to the library to avoid copyright infringement. While no one would ever find out, it's the honest thing to do. Also- No one (except me), even rents CD's from the library, so you can just keep re-renting it if you love it). Learn my tricks for that here. Savings: $14.95 per month for Rhapsody and 40.00 in iTunes purchases (approximate- I can't tell from iTunes which is apps and which is music) = $219.40 saved. Savings: about $400.00 (though this is highly debatable – just my assessment). 15. Cancelled Netflix and switched to Amazon Prime. 16. Refinanced Mortgage to historical low interest rate. (I'm just using our monthly mortgage payment to calculate savings, not savings over the life of the loan which are considerably higher). Savings: $274 per month: $3,288.00 per year. 17. Talked Jon out of purchasing every single video game that his group of Xbox friends want to play in favor of finding games that have longevity. Update: 5/19/15: Three years later, he's still playing DayZ! Best $20 spent ever! Now the challenge is to reduce it by another $10,000 for next year and come up with a whole new set of money saving tips! 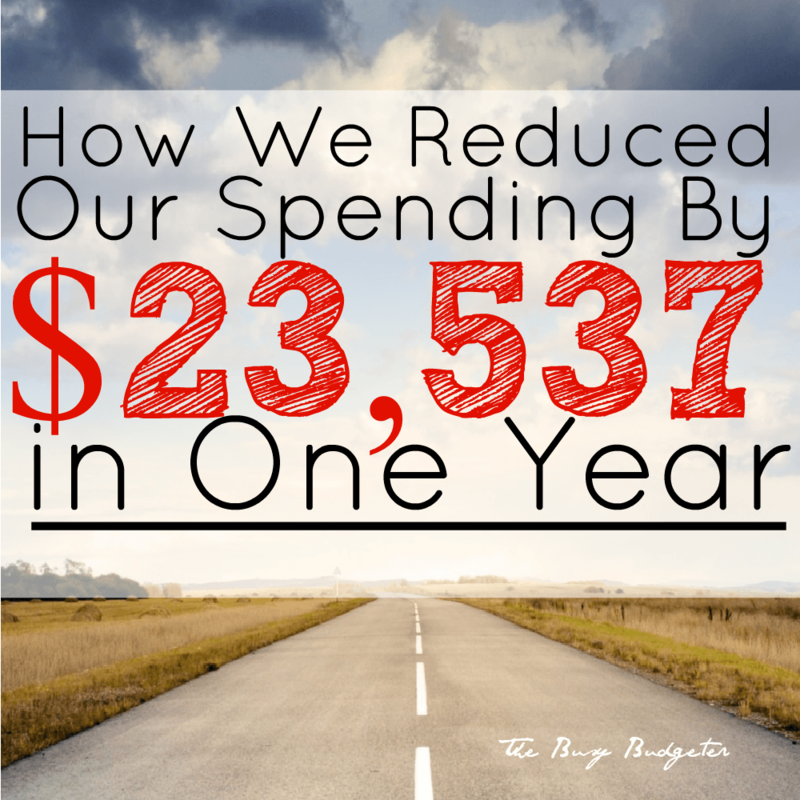 If you think this was great, you should see The Ultimate Money Saving Workbook! : 200 Ways to Decrease Your Spending, Increase Your Savings and Achieve Your Dreams! It's available for FREE to you for email subscribers. 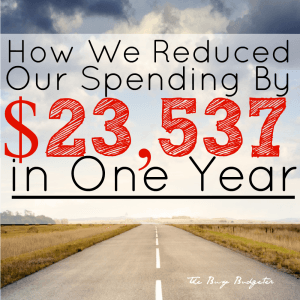 It's filled with all of the ways we've learned over the last 5 years about saving money. This workbook was instrumental in reducing our spending enough for me to quit my job so I could stay home with our kids. Click here to get your FREE copy! 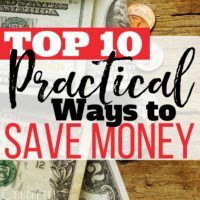 This post was shared on Thrifty Thursday and Frugal Friday. fantastic! I’m so proud of you guys, you’re amazing! I was pretty proud too when I finally ran the numbers- I knew it was high, but I didn’t realize it was THAT high! Cross your fingers for another 10,000 this year! Found you on Pinterest! (Such a great invention!) Spent the afternoon enjoying your blog but now I need to get cracking on my own Sunday To Do list! Looking forward to reading how you do the 2 week spending freeze. I read through http://smallnotebook.org/ blog for their No Spend Month.. but a month is a really really long time 😉 Doing some research to see how others have done with no spending. Seriously! How did we live without Pinterest? 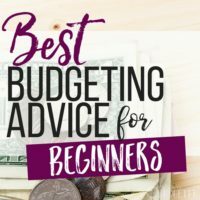 I just posted today on our spending freeze (you inspired the first post baby post!). Let me know how you do, we loved it and are planning to do another in November. Yay for saving!! $70 a week on books though?! For real? I’m an avid reader. Now I don’t have to worry about buying them, I read 2-3/week. It didn’t help that I was always buying books as soon as they released (in hardcover- the most expensive option). Sadly true. I’m an obsessive reader and even I never read them all. But I had a super impressive library of books. 🙂 Well, *had*, this was several years ago, I use the library exclusively now so I ended up selling or donating all of those books. Ack. I try not to think about the money I wasted on that. to save on video game purchases could try gamefly.com, much like netflixdvd service, and to save even more i’ve started making nearly all of my home cleaning supplies, and several hygiene products, pinterest has been a REALLY good resource to find recipes for about everything i can think of plus some. I’ll be doing spending freeze come september so i’ll be reading up on how others have done it. good tips thanks! Thanks Violet! We do a lot of our own sanitizing supplies at home. I adore pinterest! I have no IDE how I lived without them. You probably already figured this out but the best cleaning solution is white Vinegar infused with lemon or orange peels. Vinegar kills all germs and the lemon/orange leaves added shine and great smell. I put vinegar and lemon peels in a mason jar for 3 to 4 weeks then strain, pour into a spray bottle, and add water at about 50% strength. Very cheap to make. I also use Vinegar in the rinse cycle instead of buying fabric softener. Saving money and living healtier. Yes Ma’am! And vinegar is super cheap! What internet provider did you end up using? I’m also in Virginia and working on mine and my fiance’s budget as we buy our first house…haven’t been able to find an internet only price I like yet. P.S. I got amazon Prime last year before realizing how much money it would save me vs. doing Netflix. So happy with my choice!!! Hey! We had been verizon customers for years. We cancelled cable and they gave us the phone for 3 years. After the three years and we moved, they offered us cable for free and we said no (we didn’t want to pay for the cable box), so they offered the cable box for free (we said no again), so they offered to put us under “new service” with a 300.00 gift card, free cable, and a free box. We took it, used the 300.00 to buy groceries and never actually used the cable box. So technically, we “have” cable, we just don’t access it. If I had to guess, we only got that deal because we had gone so long without cable, maybe they were hoping to get us hooked? We ended up using my MIL’s netflix, My SIL’s HBO Go, we have Amazon Prime (about $5/month paid yearly with Yons of other benefits) and I get HULU for 3 months every summer when rookie blue is on. With the computer hooked to the TV though, we can watch episodes of moist shows right from the website. Great ideas! I wish we could switch our internet provider and also drop our landline, but alas, there is only one IP for our area (the phone co.) and they force us to have a landline if we want internet service. It doesn’t really sound legal, but…. My tip is this: to help you with your meal planning, keep a list of the meals you know your family loves and eats often. Bonus if you keep a list of items you need to buy for those meals. Double bonus if you keep the same lists for meals you want to try soon. Saves sooo much time and energy!!! Another time and money saver is to grocery shop only bi-weekly or even monthly. Amazing idea! This post was from 2 years ago and Our menu planning is pretty amazing right now. We use MealBoard to organize and save recipes and menu’ sand to generate grocery lists from our meal calendar! Stopping by from Thrifty Thursday. Those are some awesome savings per year! 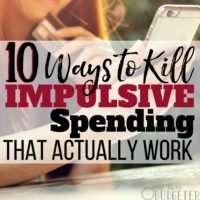 I am currently trying to reduce our spending significantly because of a pay decrease. It’s kind of crazy that only $5 per week with coupons adds up to so much at the end of the year! Thanks for sharing! Thanks for stopping by Charlee! If you have a blog, make sure to add it so I don’t miss out! Nice Job Alison! Especially in Northern Virginia, there are so many amazing things to do for free (The National Zoo, Frying Pan Farm Park, Free outdoor movies), that I can’t imagine paying for it! Awesome job!! Love seeing real numbers, helps to keep things in perspective! Thanks Jessi! I can get a little crazy in my calculations, so I’m glad their appreciated! I haven’t switched over (yet), but I have a lot of girlfriends who have opted for menstrul cups over tampons. They’re approx $50 but some last around 10 years! I haven’t done the math for savings, but if you’re in a pickles and have to get tampons full price (i try to keep a stock pile haha) they’re like $10 a box for just one size. So that’s like.. $20 a month for enough for say,.. 3 months? (Given this is all in Canadian so it might be less where you are). I’ve heard that a lot too! I haven’t tried it (I feel like I’ve been pregnant for the last 3 years straight), but let me know if you do. Wow. All of those things seem doable and fairly painless. They really were Pamela! The secret to this is to realize the impact of small changes over a year. Now, we’ve been doing these things for several years! Librarians are pretty much my Idols. Thank you for everything you do! You have the greatest job in the world! These are great tips! Too bad I already do all of these lol! But for real great list. Thats what we use, we’re about 75% of the way through I think now. We compiled a list of every single way that you can save money. I noticed that this post was from 2012. Have you reduced the extra 10 000 / year since then? Or even more? Any follow up posts to this story? Congrats on your smart maneuvers. Do let us know how the next $10,000 happens! Don’t know where you “saved” $300 on switching Netflix to Amazon Prime. At the time of your post, Netflix cost was $7.99/month x 12 = $95.88/year. I now pay $9.99/month for a total of $119.88/year. This was a lot of great info. I have already started doing a couple of these things. Thanks for the great blog. Sorry grossly over inflated…$3,600 a year in books? Umm no…try $360 a year.